Don Carlos Andrade's rendition of the kiritsuke, the 'Black Caviar' boasts a luxurious handle of exhibition-grade ebony carved in the familiar pattern Don uses for his Japanese-style stick-tang knives, a handle we would gladly hold and cut with for days. 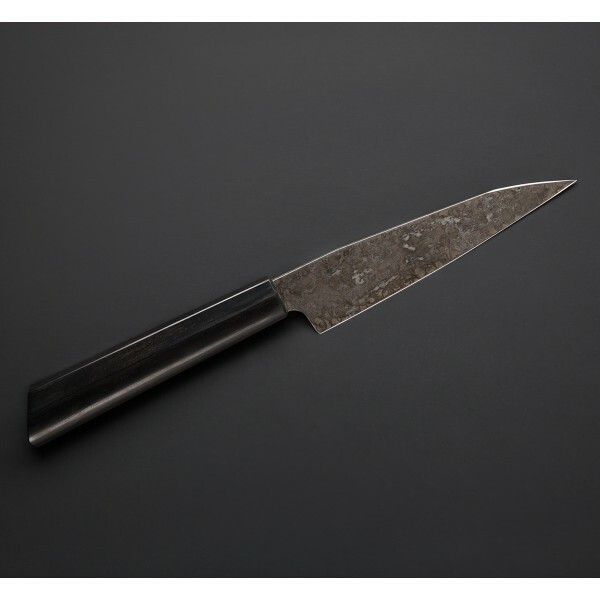 The 52100 carbon steel blade is hardened to HRC 59-60 and given a forced mustard patina, the process for which involves significant time...and mustard. 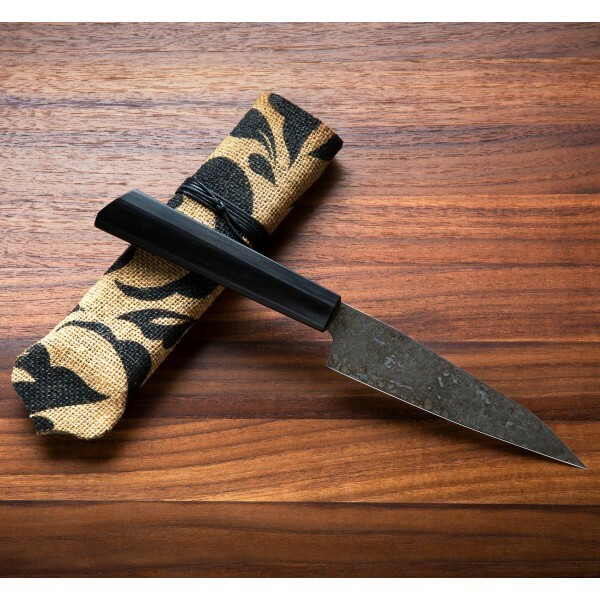 A compact kitchen utility knife in a sophisticated, black package, handmade in Los Osos, California. A cloth-covered transport case is included. 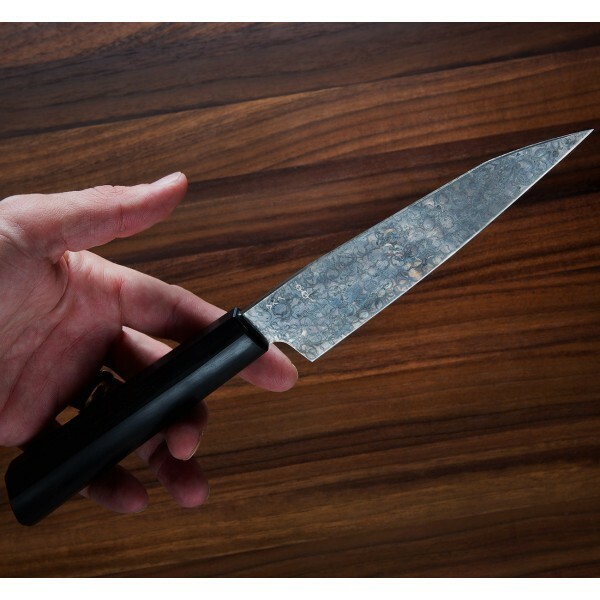 The clean lines of the profile, the marriage of design and function that Don Carlos Anrade is so skilled at, is clearly seen in this Black Caviar Kiritsuke Utility knife, designed to take over a kitchen and conquer any task thrown at it, while looking buttoned up and ready to serve all the while. 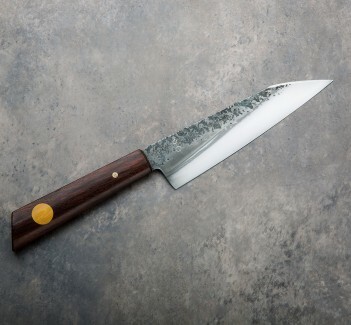 Handmade in Don's shop in Los Osos, California, this unique take on the kiritsuke is emblematic of his wanting to inspire others to cook good, real food for themselves at home - an incredibly versatile blade style interpreted in a new way and used in an equally striking aesthetic that makes us want to begin cutting the first ingredient we see. 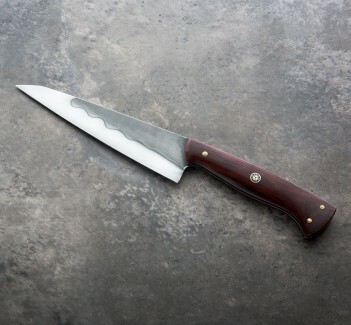 5.75" (146 mm) blade, 11.75" overall. Blade width at the heel: 3.1mm. Blade height at heel: 35mm. Weight: 3.8 oz (108 g). 52100 carbon steel blade hardened to HRC 59-60 with forced mustard patina. Exhibition-grade ebony handle.